Make a Tax-Deductible Gift to Easterseals Iowa -- Your generosity helps Easterseals Iowa provide support, hope and answers to people living with autism and other disabilities and the families who love them. Donate now with a secure online gift. If you prefer, you may also donate by mail or phone. Check can be mailed to Easterseals Iowa, 401 NE 66th Ave. Des Moines, IA 50313 or call 515-289-1933. Support the Built to Last Capital Campaign -- The legacy of Easter Seals Iowa and Camp Sunnyside has been built by countless volunteers, donors, team members, clients, family members and friends. Right now, we have the opportunity to ensure this legacy of excellence continues. Make a Tribute or Memorial Gift -- Donate in memory or in honor of someone special. You can indicate who you are recognizing in the online donation form, or checks can be mailed to Easterseals Iowa 401 NE 66th Ave. Des Moines, IA 50313. Endow Iowa Tax Credits -- Make your gift go further! Endow Iowa allows Iowa taxpayers to receive a 25% Iowa tax credit in addition to normal federal charitable income tax deductions for certain charitable gifts. Legacy Gifts -- Through personal generosity, legacy donors create solutions and change lives in immeasurable ways and for generations to come. Legacies of compassion and caring are created for uniquely personal reasons and take many forms. Your gift may take the form of a life insurance policy, bequest, annuity or trust. If you have made a planned gift to Easterseals Iowa or if we can be a resource, please contact us at 515-309-9777. Thank you to our current Legacy Society members. Pick a Brick -- Consider a unique way to honor your family or business and support Easter Seals Iowa. Commemorative bricks are available for purchase and are displayed in a beautiful new garden at Camp Sunnyside. A personalized brick can be inscribed with your name or that of a relative, friend, organization or business you would like to honor. Gifts of Grain -- Gifts of grain to Easter Seals Iowa allow donors to avoid including the sale of the grain in their farm income. Although a charitable income tax deduction is generally not available, the avoidance of declaring it as income is a significant benefit. Donors deduct the cost of growing the crops which typically results in saving self-employment tax, federal income tax and state income tax. Transfer of Securities/Stock Donations -- Have you ever considered donating your securities (i.e. stocks and mutual funds) to Easterseals Iowa? There may be additional tax advantages associated with donating securities instead of cash. Donate Durable Medical Equipment -- Easterseals Iowa loans refurbished medical equipment at a nominal fee to individuals with disabilities or illness. The Equipment Loan program operates solely through donations of good quality, durable medical equipment. We accept items in good to excellent condition. Call 515-289-1933 to arrange an appointment to deliver a donation. Donate items from our Wish List -- Donations are needed to support Easter Seals Iowa and Camp Sunnyside! You can help by donating these items to Camp Sunnyside at 401 NE 66th Ave. in Des Moines or by holding an Easter Seals Iowa Wish List Drive. For more information contact Allison Piazza at apiazza@eastersealsia.org or 515-309-9774. View a list of current items needed. Workplace and Employee Giving -- Workplace giving programs provide an easy way to join the movement to support people with disabilities and their families at Easterseals Iowa. Simply sign up for your employer’s workplace giving campaign and use automatic payroll deduction to make your donation to Easterseals Iowa. Thrivent Financial Members -- If you are a member of Thrivent Financial, there are multiple ways to give back to Easter Seals Iowa from directing Choice Dollars to receiving Thrivent support for volunteering. Register for Easterseals Iowa Walk for Independence -- Raise funds as an individual or as part of a team. 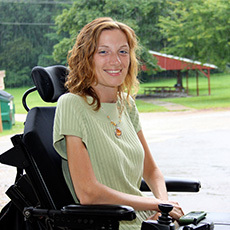 Join the President's Council -- Make a vital difference in the lives of people living with disabilities with a donation of $1,000 or more. Join our President's Council members who have made a commitment to supporting Easter Seals Iowa.